The original motivation for the founding of Wagner College was to help immigrants feel welcome and cared for in America. In the late 19th century in upstate New York, Lutheran ministers saw the thousands of German settlers as “sheep without a shepherd,” and resolved to educate ministers who could serve these people in German as well as in English. 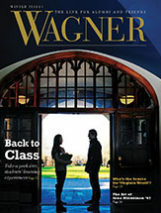 The school they established in 1883 is the direct ancestor of today’s Wagner College. 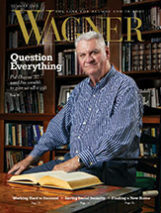 Following its founding tradition, Wagner College has helped many people find a foothold in the U.S. ever since. A subset of those migrants left their home countries not by choice, but by necessity, escaping wars, occupations, and political upheaval. We bring you a few of these stories here, from alumni of different generations — stories of strength, resilience, hard work, and gratitude for Wagner’s welcoming community and opportunities to build a new life. 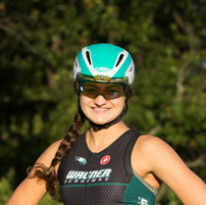 “I am eternally grateful for the wonderful education and life-affirming experiences I had at Wagner College.” Here, Edda Marder as a Wagner student. Edda Marder Schweid ’54 grew up in Estonia. Born in 1933, she experienced childhood in a country torn apart by foreign occupation and war. Edda was six years old, living in the capital city of Tallinn, when Soviet Russia started to take over Estonia and the other Baltic nations. “It was chaos and mayhem,” she remembers. From 1941 to 1944, the Nazis occupied Estonia. Being Lutherans, Edda’s family was not threatened by the Nazis’ campaigns of genocide; but, she says, “It was a hard time for anyone to survive in Europe.” She vividly remembers the worst of the wartime bombings of Tallinn, by the Soviets in March 1944. In September 1944, Edda and her mother took a ship to Germany to escape the coming Soviet reoccupation. Her parents had divorced before the war, so her father took his own escape route, ending up in Australia. Edda and her mother lived a migratory existence for a few years in displaced persons camps in Germany, first under the Nazis and then under U.S. occupation. It was always Edda’s mother’s goal to get to the U.S. “She wanted to get as far away from the Russians as possible,” Edda recalls. In 1947, she succeeded. Edda and her mother received authorization to immigrate. This year, Edda celebrates the 70th anniversary of her arrival in the U.S.
Bethlehem Lutheran Children’s Home in Staten Island hired Edda’s mother as a house parent. Edda went to Curtis High School in St. George, Staten Island, where she learned English and took refuge in her studies. Feeling alienated from her fellow students and the children she lived with, she enjoyed volunteering at the nearby Staten Island Museum. She helped with research on frogs. She started her undergraduate studies at Wagner College in 1950, majoring in biology. After graduation, she worked as a laboratory technician at Cornell Medical Center, where she met her husband. They moved to the West Coast, where she earned a doctorate in clinical psychology at the University of Washington. She and her husband divorced, and she began a career as a psychologist. Now, she is retired and lives in Santa Cruz, California. She has three daughters and one grandson. 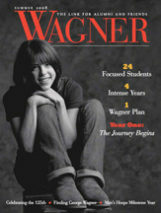 “I am eternally grateful for the wonderful education and life-affirming experiences I had at Wagner College,” she says. Edda Marder Schweid ’54 with her daughter, Wynne Bronwen Schweid, in Seattle in March 2015. George Laszlo ’72 in 1958 in Budapest, when his parents and sister were in Vienna, and he was a virtual hostage guaranteeing their return to Hungary. George Laszlo ’72 grew up in Hungary. Born in 1949, he experienced childhood in a war-ravaged city under a brutal communist dictatorship. In October 1956, the Soviet military attacked protesters in Budapest at the outset of what became the Hungarian Revolution. George’s father, Dr. Laszlo, used his 1939 Wanderer W24 to transport the wounded off the streets. After that, Dr. Laszlo continuously looked for ways to get his family out of the country. George remembers one time when his father tried to drive them over the border on country roads, only to be stopped by a Russian tank. It took a complex series of decisions and risks to complete the escape. George’s older sister, Maritza, had a medical problem affecting her gait. No Hungarian physician had been able to help her. Dr. Laszlo found a doctor in Vienna who agreed to see her, and the family was granted permission to travel there. Everyone in the family, that is, except for George. He was kept as a virtual hostage, guaranteeing his parents’ return. On July 4, 1958, Maritza and her parents departed Hungary. They never went back. With the support of Dr. Laszlo’s uncle, who lived in New Jersey, they were able to immigrate to the U.S.
From a trip in the Laszlo family's 1939 Wanderer W24. For the next two years, George lived with his paternal grandparents in Budapest, and his parents tried every method — legal or not — to get their son out. What finally worked were Mrs. Laszlo’s connections in the music world. She herself was a well-known singer and actress in Hungary. A friend from her youth, Gabor Carelli, had moved to New York City in 1939 and had become a tenor with the Metropolitan Opera. Carelli presented the family’s situation to two world-famous musicians, the Hungarian conductor Antal Doráti and American violinist Yehudi Menuhin, who used their political contacts to intercede on behalf of George. In May of 1960, George received a visa for travel to Uruguay. His grandparents packed his bag, but warned him not to tell anyone that he was leaving, not even his closest friends. Carelli took him by train from Budapest to Austria. On May 24, George arrived in New York on a UNICEF flight for refugee children. Even today, emotions overcome George when he talks about Carelli and the others who helped him escape the Iron Curtain and reunite with his family. He learned English and attended school in Brooklyn until his family moved to Syosset, on Long Island, where his father established a medical practice. Three generations of Laszlos, all named George, come together in Raven Rock, New Jersey, in 1964: Dr. George Laszlo; his uncle George Laszlo, who had a farm there and sponsored the family’s immigration; and future Wagner alumnus George Laszlo ’72 at age 15. Later, Carelli helped George attend Wagner College by connecting him with Natale Colosi, bacteriology department chair. George studied biology and played in the band, then attended Wagner’s study abroad program in Bregenz, Austria, and changed to a philosophy major. He graduated in 1972, as did his sister, Maritza. 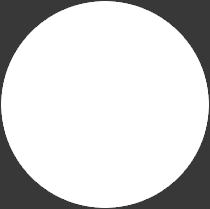 George has had a long career in research and development software for the biotech and pharmaceutical industries internationally. He is married to Eileen Sullivan, has one son and two grandchildren, and has sponsored an Iraqi refugee family. “Being an immigrant yourself, you want to help others,” he says. In Manhattan this summer, George Laszlo ’72 recalls his escape with deep appreciation. In Fort Jacques, Haiti, Edna Aurelus’ childhood home, at age 8. Now, Edna sponsors a community center in Fort Jacques where girls can develop their talents, knowledge, and confidence. Edna Aurelus M’08 grew up in Haiti. Born in 1979, she experienced childhood under a cruel dictatorship and all kinds of political upheaval. Edna remembers her childhood home, Fort Jacques, as a peaceful, even idyllic place — but her country’s troubles would soon break into her young life. Edna’s father was a supporter of Jean-Bertrand Aristide, the Roman Catholic priest and populist politician. The people elected him president in December 1990, but he was ousted in a military coup in September 1991. This new regime killed thousands, and many more thousands fled as refugees to the U.S. In September of 1992, 12-year-old Edna and her two younger siblings were home alone when armed men swept into the family’s home. She grabbed the other children and ran to her grandparents’ house. The men ransacked her home, but she and her siblings survived. “I was so lucky,” she says. The grandparents sheltered the three children, while her father, mother, older brother, and older sister hid in various locations for months. Eventually, Edna’s father was able to reunite the family in Port-au-Prince. The crowded and impoverished conditions in Haiti’s capital shocked Edna, but the family was together again. Decades earlier, in 1974, one of her uncles had immigrated to the U.S. Ever since then, he had been trying to bring his other family members to the U.S. as well. Toward the end of 1996, papers finally came through for Edna’s family. They flew to New York on December 12, 1996, to start a new life. They moved to Mariner’s Harbor, Staten Island, where Edna’s uncle lived. She and two of her siblings enrolled in Port Richmond High School, where they added English to their linguistic repertoire of Creole, French, and Spanish. “In ESL class, I was the queen,” Edna remembers. “But in regular English class, I hung back.” However, she excelled in math and science — universal languages that she was always able to connect with. Edna earned an associate’s degree from SUNY Morrisville and a bachelor’s in nursing from the New York Institute of Technology. During college, she also held down two jobs, working with people with intellectual disabilities and with mentally ill patients at a hospital. Seeking exposure to more nursing roles, she enrolled in Wagner College’s family nurse practitioner master’s program. At the same time, she started a family, marrying Mehmet Gul, a Turkish immigrant, and having her two daughters, Sarah and Victoria. Edna returned to Wagner College in 2015, after completing her Doctor of Nursing Practice at Arizona State University, to join the faculty in the Evelyn L. Spiro School of Nursing. 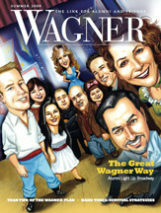 She feels the position at Wagner is just right for her now, leading her back to the places that played such a large role in her story. This year, she took nursing students to Haiti for experiential learning in providing medical care to underserved people. In addition, the College appointed her a Port Richmond Faculty Fellow, giving her the opportunity to help her first American home community. Meanwhile, she says, “Haiti is even worse than when I left it in 1996. Edna Aurelus M’08 on the steps in front of Main Hall.